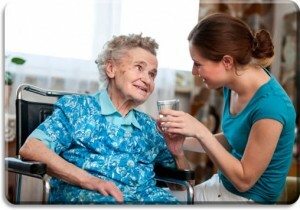 Do you know the Nutritional Needs of your Elderly Loved One? Also be aware that the calorie intake for an older person is not the same as for a middle-aged or younger individual. That’s because basal metabolism decreases as we age due to less physical activity. OptimumCare Home Care Services is aware of optimal nutritional needs of our clients and will do our best to ensure that you or your loved ones receive adequate nutrition. Nutritional needs also include adequate intake of vitamins and minerals including vitamin B6, B12, C, and D as well as calcium. Calcium improves absorption of vitamins and minerals as well as helps prevent reduction in bone mass. Vitamin C, E, and beta-carotenes provide antioxidant benefits and reduce the risk of macular degeneration and cataracts. Many seniors living in home-based scenarios without close family or friends nearby to provide oversight for their nutritional intake can be exposed to a variety of issues caused by lack of nutrition. Conditions like hypertension, diverticulitis, diabetes and osteoporosis have been linked to inadequate dietary intake by seniors. The number of seniors experiencing or diagnosed with malnutrition contributes to gum disease, depression, and high blood pressure as well as imbalance of fluids in the body that can interfere with digestive and cardio function. OptimumCare Home Care Services provides trained and experienced staff that can help you or a loved one devise a carefully balanced and affordable shopping list that ensures appropriate calorie intake and adequate sources of vital nutrients. Meal planning, cooking, and shopping for groceries are just one of the many services provided by our home health care agency.